I am also going to talk about the importance of books like Sonorite. From Moyse to Wye to Taffanel & Gaubert, there are many useful flute books available. Sonorite fits in quite nicely with other advanced books like it. Last week, I finally got my own copy of Sonorite. I took a trip to my local sheet music store and found Sonorite; I had to have it! So, here are my first impressions of the book as well as why every advancing flutist should have books like Sonorite. De La Sonorite is French for “On Sonority,” and that is what this book is all about. Sonority means sound. The flute is capable of many different sounds, and tone development give you the foundation necessary for working with different tone colors. Sonority refers to the whole sound of the flute. It encompasses tone, dynamics, and so much more. Long tone exercises, as boring as they may be, help you find the sound you want. A Bach sonata is going to have different tone colors than a French Conservatory piece. 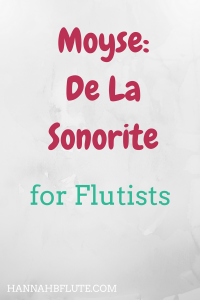 Moyse’s De La Sonorite works the whole flutist. The exercises cover the full range of the flute, and they use different intervals. While chromatic long tone exercises are important, you also need to maintain a good tone between fourths, fifth, and the dreaded tritone. Yes, there are many different resources for tone exercises. A skilled flutist could even come up with their own. De La Sonorite is important, because it is a classic. Most professional flutists and teachers have probably worked out of it at some point in their careers. It’s so popular, because it works. I have just started working through the book, and I already have a different view on tone. Working on tone doesn’t need to be a hassle. It should be fun; you wouldn’t be able to play flute if you didn’t have some sort of tone. There are many tone and technique books available for flute. Some good ones include Trevor Wye’s Practice Books for the Flute Omnibus Edition, Taffanel & Gaubert’s 17 Daily Exercises, and Maquarre’s Daily Exercises. Of those, the Wye is the only one with a tone section. All of these books are important to the serious flutist, but De La Sonorite fills a void. The Wye book covers everything a flutist should know. It doesn’t focus only on tone, like the Moyse book. Okay, I’m convinced. How do I buy it? There are many places where you can buy it. I bought my copy from a music store in my area. If you live close to any music stores, call and ask if they have a copy. Most stores can order it in, even if they don’t normally carry it. You can also order the book online from Amazon, FluteWorld, or another music retailer. This was mostly a first impressions of De La Sonorite. As I work through it in depth, I plan on writing a full review of each section and each exercise. I will not be including the exercises themselves, because the book is not in public domain. If you want to check out the book for yourself, I suggest you look into buying your own copy. Or check with a friend or teacher about borrowing their copy. This book really is the most famous, “standard” tone book. Do you have any of the standard flute practice books? Do you want to see a review of the others mentioned? Let me know in a comment below! You mention you will be discussing each section of Sonorite. Where may I find your previous discussions? I haven’t written any in depth reviews of the different sections yet, but I will add them to my list of upcoming blog posts!